Your dog has just delivered a litter of healthy puppies. In order to help them remain healthy and prepare them for a great life – in someone else’s home – you have a lot of work to do over the next eight weeks. A puppy’s first week of life is its most critical in particular, the first 24 hours. Puppies are born with an undeveloped immune system; therefore, they must nurse from their mother in order to obtain colostrum, which is loaded with protein antibodies, vitamins, electrolytes and other nutrients that will all help protect the puppies against infections and viruses. Puppies will nurse every two hours. You will know the puppies are getting enough to eat by the size and shape of their stomachs. If their stomachs are round and the puppies sleep like logs, then they have had enough to eat. However, if there is a puppy that is restless and crying a lot, it may not have gotten enough to eat. Supplementing the puppy with a special formula may be necessary. Puppies should gain weight daily and be weighed every day for the first two weeks to ensure they are gaining a sufficient amount of weight. “Failure to gain weight is often the first sign of illness in puppies,” according to Pet Education. At around three weeks of age, the puppies should start being fed puppy mush three to four times a day. The mush is pureed puppy food combined with liquid puppy milk replacer and water. It should be the consistency of infant cereal. Each week, you should decrease the amount of milk replacer and water added to the pureed food so by about seven weeks old, the puppies are eating only the dry food. By seven weeks of age, the puppies should be fully weaned from their mother. Weaning will occur naturally as the puppies eat more solid food and less milk from their mother. Decreased milk consumption will cause the mother’s body to naturally slow down its milk production. Immediately following their births, the puppies must be examined by a veterinarian to ensure there are no health problems. Puppies need to be de-wormed for roundworms and hookworms, the first time, at two weeks of age. De-worming is repeated at four, six and eight weeks of age. The puppies require one final check before going to their new homes – around seven weeks of age. Most puppies head to their new homes at eight weeks old. The first four weeks of a puppy’s life is one heck of a busy time. About two to three days following their birth, the umbilical cord will fall off. Between days seven and 14, the puppies will learn to crawl, which is followed by walking at about day 16. The puppies should have a normal gait/stride at 21 days. 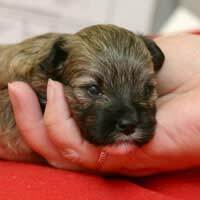 When born, puppies have no teeth – they start to come through when the puppy is between two and four weeks old. All of their baby teeth will be in by week eight. Around days 12 to 15, the puppies’ eyes will open and their vision will become crystal clear by week four. The puppies’ ears will open just shy of three weeks old and within a week of that, they will have their full hearing established. It is imperative puppies be exposed to all kinds of people, especially children, as well as household noises – banging pots and pans, doorbells, vacuums, other animals, etc. Early exposure to everyday sounds will help the puppy become a confident and well-adjusted adult dog. While the puppies are discovering their feet, teeth, sounds and each other for the first time, you should be looking for their new homes. When you know a litter is on the way, ask your friends, family and co-workers if any of them would like to add to their family. Also let your vet know you are in need of assistance in placing the puppies. You never know when a client might mention they are looking to add to their family. Once word is out and inquiries are flooding in, screen each applicant carefully. Ask them everything – how did they hear about the puppies; have they had a puppy or dog in the past; if so, what happened to it; what are their living conditions – apartment or house; do they have the room necessary to accommodate the breed’s activity needs; are there other pets in the household; are there children in the household; what are their plans for meeting the puppy’s needs – will someone be at home during the day or available for the numerous toilet breaks and lunchtime feedings; what is their lifestyle – is it conducive to the breed or even to having a dog. Once you have narrowed down you applicants, do a veterinarian reference check if they had or currently have pets to ensure they do provide the level of care they say they do. Have the applicants come meet the puppies and watch them interact together. You will be able to see who truly loves dogs and who does not. Once you are comfortable with your choices, let the people know they are the new parents of a puppy. Myself & Andy (husband) had to have our Border Collie 'sam' put to sleep in July 2012 he was 17, & we bought him when he was 6/8 wks old. It left a big hole in our lives as my husband used to walk sam early in the morning over our local park &occasionally we gave him a 2nd walk about mid afternoon, he was a docile dog friendly to everyone specially if they shared his love of the odd biscuit, he never ever barked unless he thought I was in danger, if I wasn't well he wanted to be by my side so always laid at the bottom of the stairs and had no interest in going for his walks with my husband until he knew I was okay. But it was a sad day in our lives when we had put to sleep, but we done this because we loved him &would have been a really cruel thing to do in keeping sam here with us, Sam had a great life with us and touch the heart of everyone he came into contact with (family ) but 3 years have passed now and I believe that it is now a good idea to advertise &try and find another puppy that again we can have for a large part of the dogs life as well as ours. The thing is that my husband wants a husky puppy, malamute puppy & myself would like another border collie puppy or black labrador puppy we would love it to be about 8-10 weeks old, we are home 24/7, so the animal welfare is not an issue with us as myself and my husband have grown up with a dog in our lives,also I would like to point out that if we go away for any holiday or over to family at Xmas the puppy /dog would always be with us and never left to fend for itself. but the only thing, I can not afford a great deal of money as I'm on long term sick due to many medical problems and my husband is my full time carer, so my benefits does not leave us a great deal after bills, Ideally I would love &like a free puppy of the above choices, but if this can't be done I'm willing to pay £100, &maybe a little more if the right pup comes available and is close to where I live in Essex /East London. If you can help please contact me on 0208-592-2164. Thanks for reading, Jane.